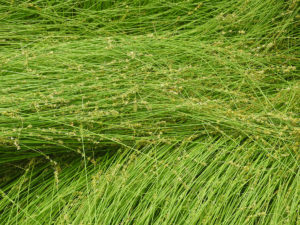 The latest hot plant that we are all excited about is Carex rosea, also known commonly as Rosy Sedge and Curly Wood Sedge and Curly-styled Wood Sedge. The alert reader may wonder why we are so excited about such an obscure and unpopular a plant that has never even ever been in our price list. That, right there, is the reason for the excitement because we made over $250,000 worth of this plant last winter. I did not count the exact amount that we made because of the difficulty in seeing due to the tears in my eyes. We thought we were making Carex pensylvanica all that time and I had the money already spent on gravel for the pot holes and for a few new shade houses and maybe a delivery truck or two; all dreams never to be. The last few days we have been checking around to see who might have been responsible for this error and I have never seen so many innocent people all in one place in my entire life. It appears that half of the innocent people in the world are working for me right now. The good, albeit strange, news is that our several thousand feet of really good established Carex pen. rows out in our growing fields are all pure and true-to-name. 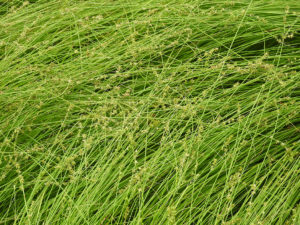 With carex one can only tell by the seed heads, and then, of course, only when they are blooming. 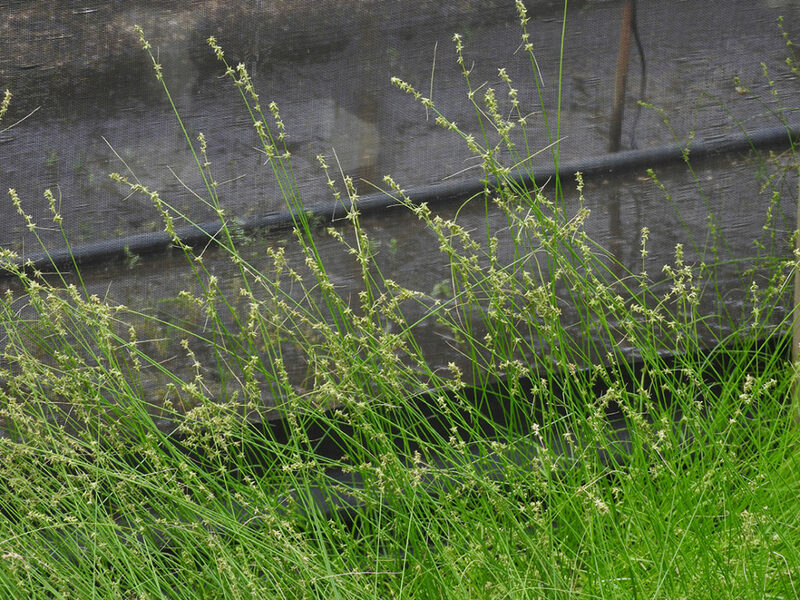 We see from looking things up on the internet that with C. rosea: “The spikelets look somewhat like green starbursts due to the presence of 7-14 spreading perigynia. The interesting pistillate florets within the perigynia have threadlike rosy pink coiled stigmas that protrude from the top.” Maybe that explains why we were not paying attention to carex blooms heretofore. We are starting to pay attention to that little detail all of a sudden. The smart person around here who pays attention to plants and the tracking thereof around the several nursery locations is Serbando and he tells me where the plants came from that were planted into which fields that were then dug in November of ’17 that caused all of these problems. It all started with some really thick one gallon material at one of the main container growing farms and we have no idea where these came from. In early summer 2016 these went over to another farm to be split and re-potted into gallons to be divided the winter of 2017 to be field planted at two of our farms in Spring 2017 to be dug Fall 2017 to make the quarter of a million dollars’ worth of worthless plants unless we can talk some unsuspecting person into purchasing these from us. They are really nice and a native plant, to boot, so they should help out with a lot of street cred for the landscapers. Those heavy carex gallons would have been made during the previous management team’s reign and thus we can not even figure out who sold the wrong mislabeled liners to us so that we could print their name in these Blogs half a dozen times. And so, instead of having lots of Carex pen. to sell, we have to locate some for our good customers. 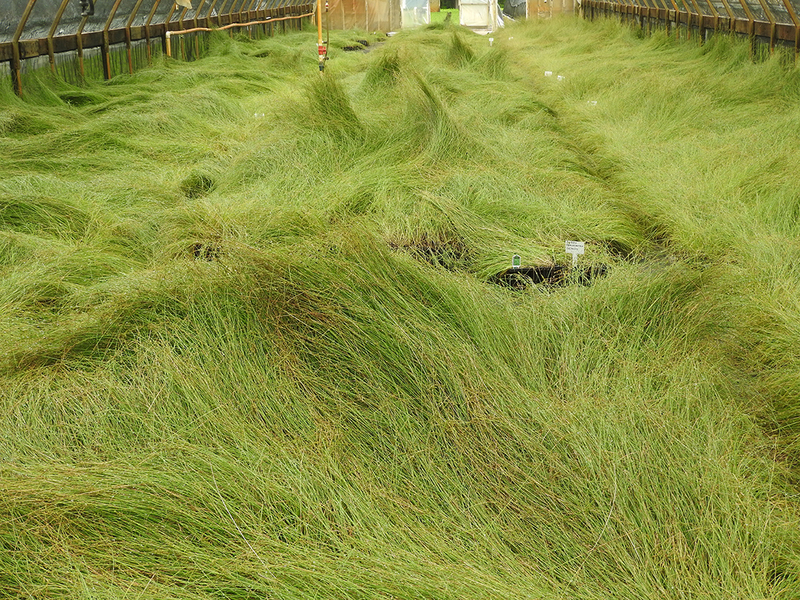 At least we got in a lot of practice making and growing Carex last winter and the team and the system are in place. One would think that a fire sale here at Twixwood would be going on about now. I defer on these things to our sales manager, Homer, who has to make all of the hard decisions around here. We think he is paid well for this harassment. Because these blogs are supposed to include my inner-most feelings, here are some. We grow plants in the field so that we have a couple of years to rogue them out. ‘Rogue’ is the technical term for when we check the plants when they are in bloom and then dig out the mistakes. We did not have enough experience with Carexes around here to have an expert on their blooms. So, we did not do this in our fields heretofore. At least our daylilies and astilbes are in pretty good shape. Besides, I like growing plants in the field and making our own liners and, eventually, I hope to make money selling true-to-name liners to the market. We have a good trained crew that works all winter dividing and splitting and potting carex and grass and geraniums. One of the problems with field growing is when a plant does a lot of self-seeding. Years ago we got out of the Buddleia business because of that. More recently we got out of the Pennisetum “Ginger Love” business because of its self-seeding. And now, after finding out that we can grow and divide and make money on it, we are seeing self-seeding in the Bouteloua g. ‘Blonde Ambition’ PP #22,048. We will try to control this enough so that our dividing stock is all true-to-name. Now, my inner-most feeling is that we should sell some more plants and make a little money.